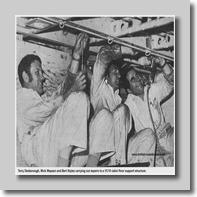 “Progress report Tango Juliet, Instrument Supervisor has decided to change starboard outer brake thermocouple. Estimate serviceable within 20 minutes”. “Yes, thank you, will inform service control”, came the reply from the Station Engineer. So went a routine conversation in BUA’s Line Maintenance organisation, the front line of a £2.9million per year engineering department. Line Maintenance look after fault finding, rectification and also daily checks, A and B.
Syd Burgess, the Station Engineer, was charged with putting Tango Juliet back into service, he was in charge of Line Two that shift. Syd was assisted by John Taylor, mobile in his van on the apron. 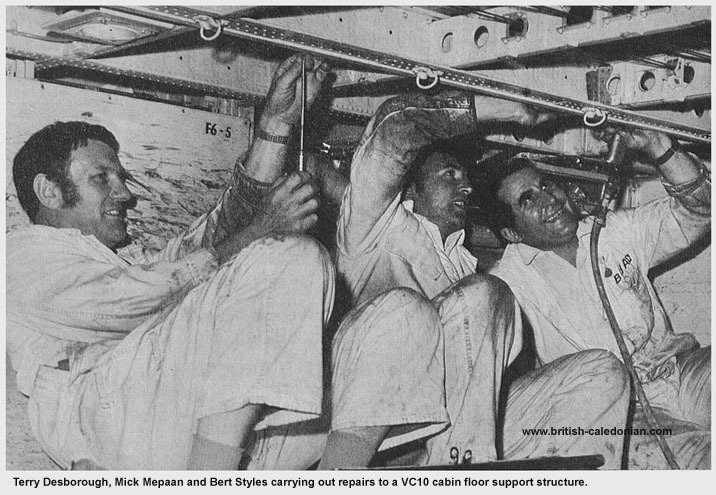 The work started after the 1-11 Captain had reported that his starboard brake temperature indicator was not functioning properly. 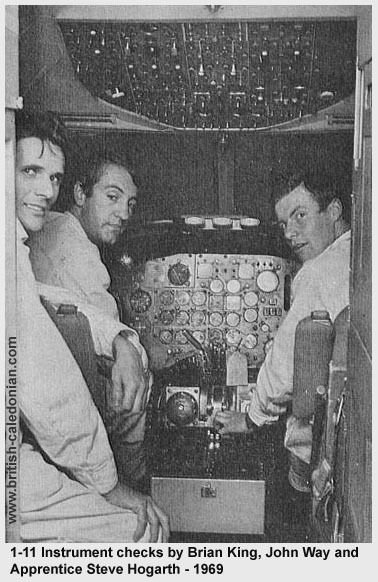 The problem was radioed ahead, so that checks could be made straight away, saving valuable time and ensuring the aircraft was back in the air quickly. 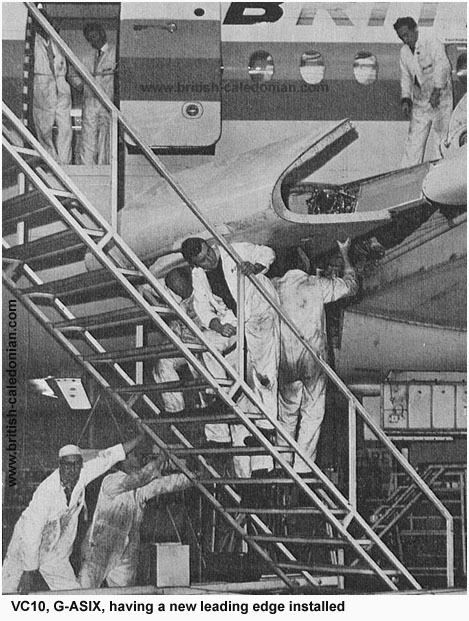 Using a soldering iron to simulate overheating brakes, each part of the system was checked by the engineers, resulting in the new thermocouple being installed. The work was completed in the usual turnaround time, and Tango Juliet was away on schedule. 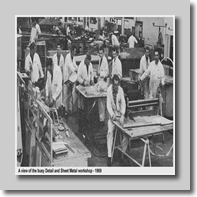 Around 800 staff are employed on this task with labour costs approaching £1million and material and parts accounting for another £1.5million, give or take a few pounds. 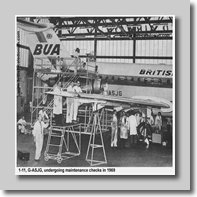 The basic aim of engineering is to keep BUA’s fleet safe and ready to fly, liaising with all depaertments to schediule in the checks and maintenance work. Engineering policy is formulated by Mr W.A (Bill) Richardson and the day to day running is entrusted to Mr Arnold Sheead. The production division emplys the majority of staff, and is run by the chief maintenance engineer, Jim McLean. A natural division is drawn between Base maintenance and Line Maintenance, with Base maintenance carry out the heavier checks and work that usually take the aircraft off the Line. 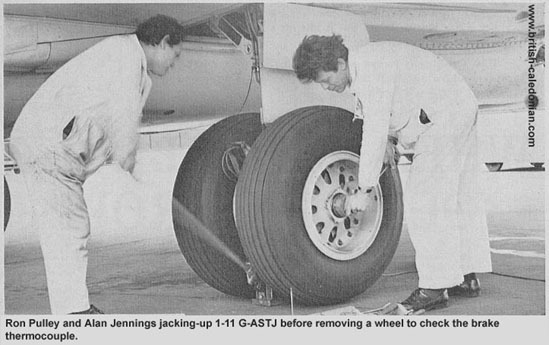 With the demand to have aircraft in the air, many of the heavy checks are split into sections to enable them to be undertaken between the commercial needs of scheduling and timetables. The Base maintenance is controlled by Superintendent Peter McFarlane, and his task is supported by workshops specialising in radio, instrument, electrics, hydraulics, detail, power plants, components, safety equipment, upholstery and paintwork, all the workshops are under Geoffrey Charlton. 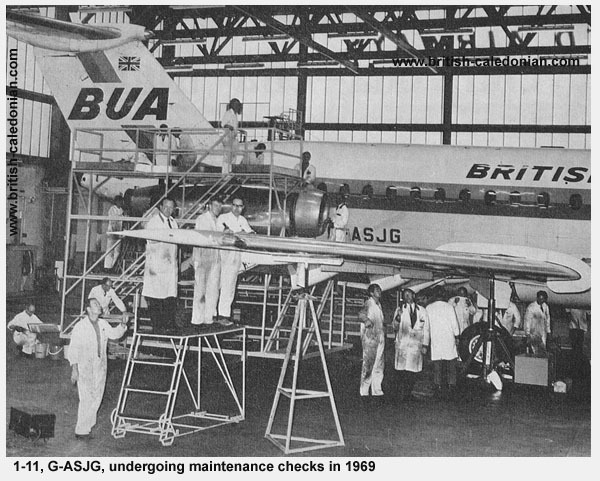 The work is checked by Vernon Jessup, who is the Chief Inspector, and he ensures that it meets BUA’s standards and those set by the Air Registration Board. A dual system of checking has been introduced, whereby routine inspections are undertaken by the supervisors and foremen, with sample checks made by the Inspectors. 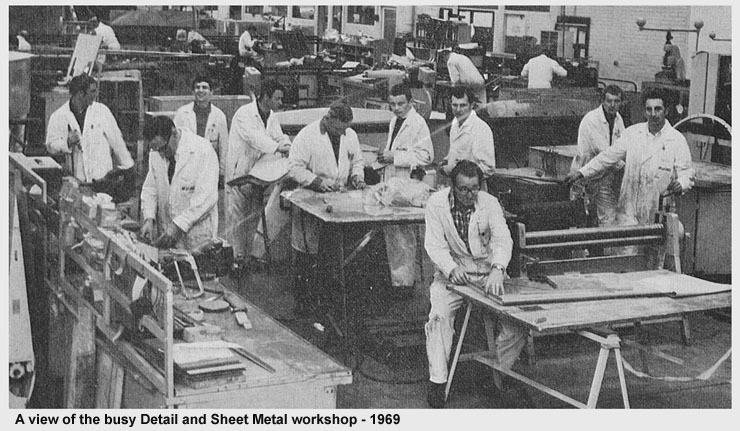 Veron Jessup also looks after the engineering apprentices, assited by Eddie Dove and Buck Ryan. 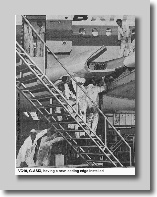 Weights engineer, Brian Payne, liaises with the commercial and traffic departments informing them of the permissible loads for each aircraft, in the configurations they are set to fly in. He also looks after new aircraft, ensuring that they do not exceed their design weight, so able to fly the services BUA envisage for them. 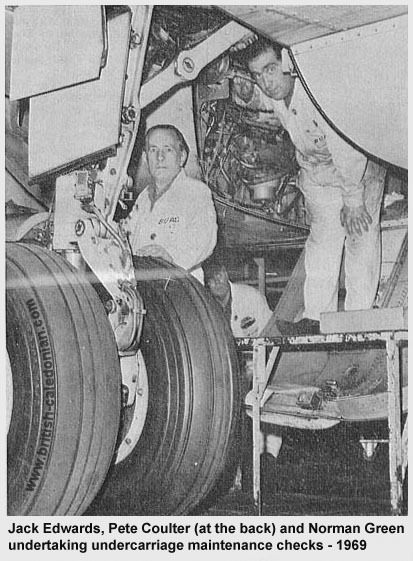 Chief materials planning engineer, Les Bishop, is responsible for the £2million worth of stores contained within the aircraft bonded stores, commercial store and the work’s engineering store, with Ernie Cummings, who is the Stores Supervisor. The planning of stores and stock levels is undertaken by Bunny Burrows, John Graham and Ralph Fournel. 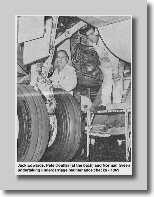 They also look after the planning of stores to be held for new aircraft types. Eddie Everett looks after the rotation of stores that need to be changed regulary and the scheduling of maintenance on spares. Any parts required for aircraft modifications are planned by his team, which also look after the Technical records. The economics of the Engineering department fall to Ken Anderson, who also controls the budgets for the sections and decides if work should be contracted out, this is done in liaison with Ron Bradburn, Purchasing Manager. Maurice Hale analyses new aircraft for the group, from a technical viewpoint, which forms part of the overall decision to commit to the capital spend, no point buying something that cannot be maintained economically.